We offer video and audio recordings of seminars and lectures plus book lists, book reviews and our own journal, Research Briefings, which contains articles about issues at the Muslim-Christian interface. 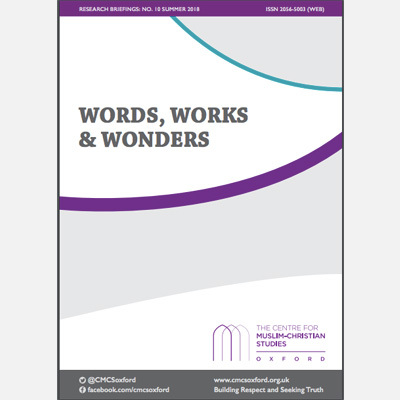 We offer specialist materials on the Muslim-Christian interface, including video and audio recordings of previous seminars and lectures plus book lists, reviews and journals. If you're interested in our research projects, click here. Missed an event? Don't worry. Catch up with past seminars and lectures by streaming or downloading the audio recordings. Our termly Research Briefings offer short papers from researchers who have presented seminars at CMCS along with editorials and book reviews. We have full video recordings of our Annual Joint Lectures available for streaming. They are also available by request in DVD format. Looking for a reading list to help you along with some initial study on the Muslim-Christian interface? Start here. Useful summaries and reviews of books on Islam and the Muslim-Christian interface. All reviews are open for comment and debate. At our Oxford office we house numerous titles on Islam, Christianity and the Muslim-Christian interface; the library also has desk space and WiFi. CMCS was born of a vision to strengthen the clarity, integrity and capacity of future scholars, educators and leaders in thinking about Muslim-Christian relations. The study aids and resources on our website enable us to reach out to people at the Muslim-Christian interface all over the world. So it can be a valuable resource to its users, our website needs to be constantly kept up to date with new events, seminar recordings and resources, work which is carried out by a third-party website administrator. If you believe in bringing Muslims and Christians together to promote integrity and build understanding through teaching, research and public education, please consider making a donation to allow us to continue to maintain our website.